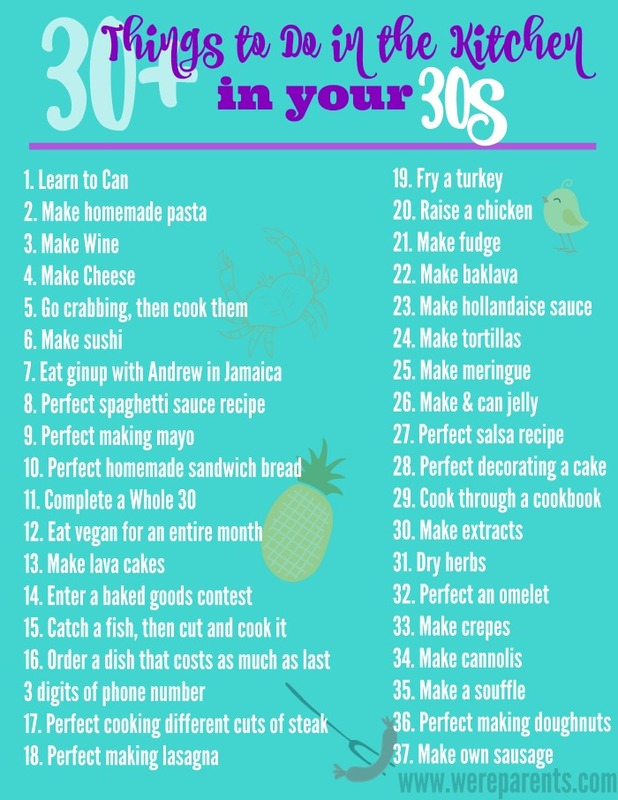 Today, we’re sharing 30 things to do in the Kitchen in Your 30s! Enjoy! Sometimes I sit and realize that I am actually in my 30s. I know I’m not the only one either. Those of us who feel like the ’90s were only ten years ago, still waiting for the “real adults” to come and pick up these children (seriously, who left us in charge), and sometimes don’t realize all this chaos is really ours. Since turning 30 last year, a lot has changed. In a way, I feel like I’ve grown into more of an adult in the past year than any other time in my life. Of course, I still have a lot of work today on personal growth, but hey, we are all a work in progress. Speaking of progress, one of my goals for my 30s is to learn my way around the kitchen more efficiently. I didn’t start cooking until I was in college and didn’t really start learning until I became a mom a few years ago. Because of that, I still have a lot of learning to do. Last year, I created a list of 30 things to do in the kitchen in your 30s. While this list is tailored to me, I would love to hear what’s on your list. Don’t have one? No worries! Set a timer for 5 mins and write down as many ideas as you can! Then, get to work! Andrew is really excited to partner with me side by side and learn how to do some of these things himself too! We can’t wait to share with you guys some of the things as we do them!